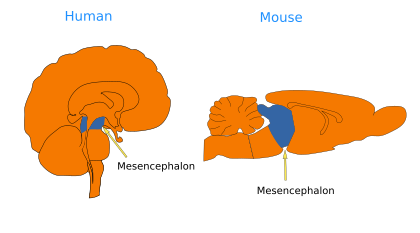 Mesencephalon is located between the rhombencephalon and the diencephalon (caudal part of the prosencephalon). It is also known as midbrain. Anatomically, mesencephalon is divided in alar plate (dorsal) and basal plate (ventral). The four culliculi (corpora cuadrigemina) are found in most dorsal part of the alar plate and the tegmentum in the basal plate. In humans, there are prominent columnar structures in the ventral mesencephalon, known as cerebral peduncles, which contain the descending cortical projections (pyramidal pathway) and ascending sensory tracts. Colliculi are located dorsally in the mesencephalic tectum. They are four small outgrowths, two superior (or rostral) and two inferior (or caudal) colliculi. Superior colliculi are involved in visual processing and ocular movements. Those animals lacking visual cortex use superior colliculi as main centers for visual input processing. Inferior colliculi are involved in auditory information processing. Transversal view of the human mesencephalon where some structures are sketched. The mesencephalic tegmentum contains the reticular formation, an elongated structure located ventrally in the middle part. 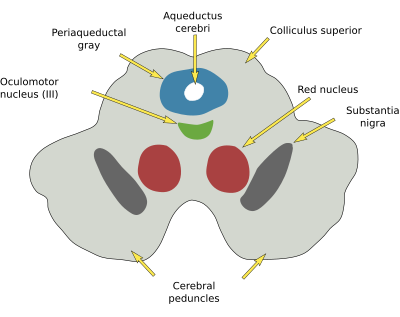 It is composed of nuclei of the periaqueductal gray, red nucleus and substantia nigra. Substantia nigra sends important dopaminergic innervation to telencephalic areas. The oculomotor nerve (cranial nerve III; motor nerve) leaves the encephalon through the mesenchephalon, ventrally to periaqueductal gray, and in most vertebrates, human included, innervates four extraocular muscles (three rectus and one oblique), as well as the elevator of the upper eyelid and the intrinsic muscles of the eye (ciliary and pupil muscles). The trochlear nerve (IV nerve) leaves the encephalon through the dorsal part of the mesencephalon. The functions of this nerve are involved in hearing, vision, motor control, alert and regulation of the temperature. Puelles L, Martínez S, Martínez de la Torre M. 2008. Neuroanatomía. Editorial Médica Panamericana S.A. ISBN: 978-84-7903-453-5.